Ballantines Finest Blended Scotch Whisky is a popular Whisky available from DrinkSupermarket.com in 70cl to buy online. Visit DrinkSupermarket.com for the best price for 70cl of Ballantines Finest Blended Scotch Whisky or compare prices on our other Whisky products. Ballantines Finest is a blend of Whiskys that has come to cement Ballantines as being at the forefront of the blended whisky makers. Originally created in 1827 this blend has gone from strength to strength and is created by refining more than 40 single malts and 'finger print' malts to create this wonderful blend. A deep rich flavour with hints of botanicals with a well rounded palate. Where to buy Ballantines Finest Blended Scotch Whisky ? Ballantines Finest Blended Scotch Whisky Supermarkets & Stockists. 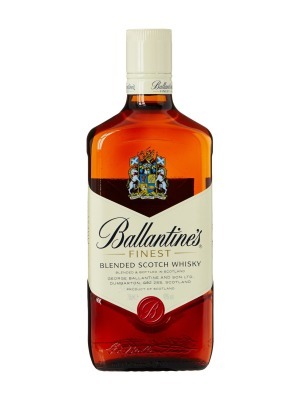 You can buy Ballantines Finest Blended Scotch Whisky online in most retailers and find it in the Whisky aisle in supermarkets but we found the best deals online for Ballantines Finest Blended Scotch Whisky in DrinkSupermarket.com, Waitrose Cellar, Tesco Groceries, TheDrinkShop, and others. Compare the current price of Ballantines Finest Blended Scotch Whisky in 70cl size in the table of offers below. Simply click on the button to order Ballantines Finest Blended Scotch Whisky online now.